I must preface this review by saying that I had decided this film was going to be awful before I ever saw it, based on the trailers alone. While watching, however, I did my very best to remain objective and to base my opinion of the film entirely on the film itself rather than on my preconceived notions. Of course, this is impossible unless the film had strongly convinced me to think contrarily to my initial thoughts, which it didn’t. So here’s my review of Turbo. The trailers for this film told this story: a snail (Ryan Reynolds) dreams of being fast, but, alas, he’s a snail, which means he’s slow. However, upon accidentally getting sucked into a car engine in the middle of a street race, the snail swallows some nitrous oxide, causing his DNA to alter, making him super fast. What better to do with his newfound speed than to enter the Indianapolis 500? Rest assured, everyone…the film tells that exact same story promised by the trailers, albeit with a few added characters along the way. Once he becomes fast, the snail (named Theo before adopting the name “Turbo”) is captured along with his brother, Chet (Paul Giamatti), by half of a taco shop-owning brother duo, Tito, voiced by Michael Peña, who takes the two of them to participate in what appears to be a serious underground snail race with snails owned by other local down-on-their-luck shop owners. When Theo surprises all with his super-speed, Tito thinks up the idea to bring in business by introducing the world to his snail via the Indy 500. 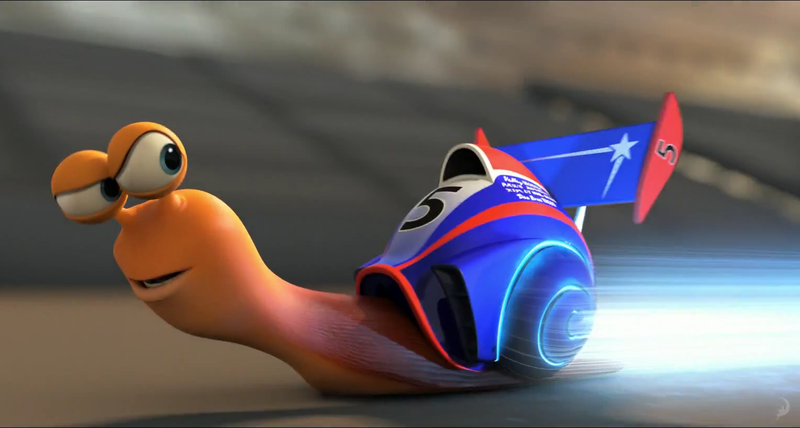 The characters are uninspired, including and especially Turbo as the lead character. I didn’t care that he wanted to be fast, and I didn’t care when he became fast and (spoiler alert) wins the Indy 500. I didn’t care that his brother thought he was crazy to go race in the Indy 500 because, hey, I agreed with him. If I strapped rockets to a pair of roller blades, would that qualify me to race in the Indy 500 as well? The script doesn’t convince me that this is an absolutely necessary path to take for either Turbo to fulfill his dream or for Tito and his brother/friends to bring customers to their businesses. Speaking of Tito, his personality is so obnoxious that I didn’t care whether he succeeded in helping his brother realize his dream either. Character building is kept to a minimum, with the turnarounds of both Tito’s brother Angelo (Luis Guzmán) and Turbo’s brother Chet feeling incredibly uninspired. None of the voice acting talent stands out either, with voices from Ryan Reynolds, Paul Giamatti, Snoop Dawg/Lion, Samuel L. Jackson, Maya Rudolph, and others all falling short. Probably my biggest problems with this film are the inconsistencies and moments of outstanding ridiculousness. For starters, the beginning of the movie features a scene of Theo (not yet fast) pushing a TV off a shelf, but when he’s “trapped” under a plastic cup later on he is powerless to do anything. The idea of a sort of tomato harvesting factory run by snails existing in a residential tomato garden, complete with tomato-rolling rails, is ludicrous. The biggest inconsistency for me is the whole issue of “speed.” Let’s do the math here: one scene prominently featured in the trailers shows Theo traveling about one foot (twelve inches) in seventeen minutes (“a new record!”). The accident where he gains his speed takes place over a highway. Even if this highway is only 1/10 of a mile away (528 feet), that would be approximately 150 hours of travel time at the “record” speed, but it takes place over a single night. That issue aside, here’s another: I’ll accept the fact that NOS gives Theo super speed, but why oh why does it give him characteristics of a car too? Headlights, a stereo system, etc. It makes no sense to me. All in all, the best I can say about this film is that I didn’t hate it and the worst I can say is that it’s flat-out stupid. I have to admit that the ending did have my smiling a little bit, but the overall film just isn’t worth smiling at. The awful premise and the logical inconsistencies/stupid character decisions combine to make this Dreamworks title one of the company’s worst. “But it’s a kid’s movie!” I hear someone shouting at me over the Internet. “So are the Pixar films!” I say in return. I love baseball. I grew up playing baseball and have fond memories of attending Texas Rangers games with my family as a child, so I can always appreciate a good baseball film, whether it’s a baseball film that isn’t really about baseball (i.e. Moneyball), baseball films that ARE about baseball, or even cult classics like The Sandlot. After last year’s Trouble with the Curve left much to be desired (my review), I was quite excited to see 42, even from the very first trailer I saw for it last fall sometime. I desperately wanted it to be a great film, but, unfortunately, I was pretty disappointed. 42 tells the story of how Jackie Robinson (Chadwick Boseman) became the first African American baseball player to play in Major League Baseball in modern times. He’s now considered to be one of the greatest baseball players of all-time. His legacy continues in the form of Jackie Robinson Day, celebrated by players in the MLB every year on April 15 (which, not-so-coincidentally, is the date on which I’m typing up this review). Robinson was and continues to be a giant in the world of baseball; however, this film does a poor job of showing all of this. Almost all of my complaints have to do with characters and dialogue. I understand the need to take liberties with history to make it fit into a movie that caters to its audience better, but 42 seems to me to be severely over-romanticized. The relationship shown between Jackie and his wife, Rachel (Nicole Beharie), is sickeningly sugar-sweet throughout, with there not being a single bit of conflict shown between the two of them. While “lack of conflict” is not a problem in and of itself, Rachel’s dialogue is disgustingly cutesy and over the top. Harrison Ford as Dodgers general manager Branch Rickey is strange; he talks in as low a voice register as possible, makes analogies that never make sense, talks at the rate of about seven words per minute, and constantly waves around a half-smoked, chewed-on cigar. As much as I love Harrison Ford in just about everything else he’s done, I really didn’t care for him here. Another character, a small African American boy who is apparently supposed to be younger version of someone who was inspired by Robinson in real life and eventually made it to professional baseball, has incredibly corny lines, namely one in which, after running after a train that Robinson is riding in, he places his head on the tracks and says to his friends, “I can still hear him!” It would have been perfectly achievable to show us that people were inspired by Robinson without this awful child character, and, in fact, that is done better later in the film when Rickey tells Robinson that he saw a little white boy pretending to be Robinson. The only actor in this film who I can actually praise is Boseman, who plays the closest thing to a believable character to be found in the film. He never tries to be over-extravagant with his actions or emotions, and the moments in which his emotions ARE heightened never feel false. He plays the role admirably, which is a good thing considering the fact that the film is about him and we’re supposed to care about him; frankly, I didn’t care about any of the other characters. I liked some of the Christian statements made in the film by Rickey, who was known for his strong Christian beliefs, though I wasn’t overly fond of the bad language that often accompanied his biblical wisdom. I also liked some of the themes of struggle and equality that were present in the film, though I wasn’t overly fond of the characters who embodied these themes (i.e. Wendell Smith (Andre Holland), an African American journalist who wasn’t allowed to sit in the press box with the white journalists). You can tell that I really didn’t enjoy this film, but you should also know that I didn’t hate it. Yes, it has its problems (including several that I didn’t mention here), but it’s still a decent baseball movie, and Boseman in the main role makes up for a lot of the film’s faults. I don’t claim to be a Jackie Robinson expert or even remotely knowledgeable on the subject, but I’d like to think that my points are valid and that I’m not the only one who thinks this way. 42 will certainly please casual moviegoers and those who may not be as bothered by the characters as I was, and hopefully fellow baseball lovers will find something to enjoy as well. After all, this movie is all about one person who just wanted to play the game. This is a film that I had anticipated for a month or two before its release, but, for some reason or other, I never saw it in theaters. I’d never seen a Clint Eastwood film before (unless you count the brief snippet of A Fistful of Dollars that appears in Back to the Future Part II! ), and the only film I’d seen Justin Timberlake in was The Social Network, so it was interesting for me to get familiar with a couple of unknown (to me) actors. However, the ending result was disappointing. Clint Eastwood plays Gus Lobel, an old baseball scout who dislikes change and is beginning to have trouble with his eyes, which is a problem when he is asked to scout a potential new player in North Carolina. His daughter, Mickey Lobel, played by Amy Adams, is a successful lawyer who accompanies her father on this scouting job, hoping to help him keep his job and to possibly mend a rough relationship between the two of them. Along the way, they run into Johnny Flanagan, played by Justin Timberlake, an ex-pitcher who was once scouted by Gus himself, who is now scouting for a rival team and takes an interest in Mickey. Trouble with the Curve struggles with getting the audience to connect with its characters. When Mickey tries to talk with Gus about their rocky past, it’s sudden and almost out of place; there is nothing to make me sympathize with her or to make me angry at Gus for pushing her aside when she was a little girl. Despite Amy Adams’ best efforts, I feel no connection with her character, though she’s certainly a talented actress. I think most of the issue is to blame on the script and her opposing male leads: Clint Eastwood may have once been a great actor, but that appears to have left him with age. His character is flat and uninteresting, and the lack of inflection or variation in his role is upsetting. At least he can blame old age, though…Justin Timberlake’s character is just as bland as Eastwood’s in spite of the fact that Timberlake is certainly likable (I thought he was fantastic in The Social Network), and he has an unusual talent of showing up wherever Gus and Mickey tend to be. In addition to these acting issues, I take issue with the script and the title: the story is convoluted, the relationship between Gus and Mickey just doesn’t work very well in the context of the job at hand, and I have no idea how the title is supposed to connect to their relationship. There is an obvious connection between the title and an event that takes place in the last bit of the film, but I just don’t “get” what relevance a curve or curve ball has to the Gus/Mickey father/daughter relationship as presented in the film. I didn’t dislike everything about this film, though. As I said before, Amy Adams is certainly a talented actress, and she manages to shine through the film’s issues at least a little bit. 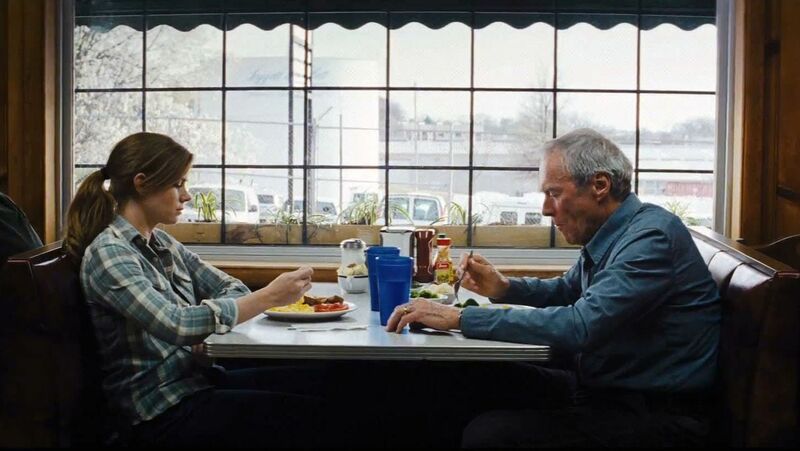 There were also several instances of humor that didn’t feel out of place or overcooked, which helped to balance out some of Eastwood’s aged performance – with a performer like Eastwood, filmmakers are able to give him a good one-liner that just puts everything at ease for a moment while you laugh. This was a film that I desperately wanted to love. I really enjoy Amy Adams and I really enjoy baseball, so I thought that a combination of the two would work really well, and, while it didn’t completely fail, it was still lacking in many ways…it fell short of what it could have been, and most of that could be blamed on the script rather than on the actors. Eastwood is old, and, as much as we want such a well-known actor to keep going strong, I think it’s just about time for him to throw in the towel. I enjoyed Trouble with the Curve overall, but its failures can’t be overlooked. I first read the plot summary of Rise of the Guardians somewhere in the beginning months of 2012, and I thought that it was one of the most ridiculous plot summaries that I had ever read. However, that all changed when I saw the trailer for the first time a few months later; the animation was beautiful and the idea of putting twists on all of these supernatural beings that we grew up believing in seemed like a lot of fun, and I suddenly became extremely excited to see this movie. Unfortunately, when I was finally able to see the film a couple of days before Christmas, I was highly disappointed. The failure of the film isn’t in its re-imagining of beloved childhood heroes, which I thought was done rather well (Alec Baldwin’s Russian-inspired Santa Claus was particularly amusing), but rather in its inability to tell the story implied by its title. Instead of being treated to a story of how the Guardians – Santa, Easter Bunny, Sandman, and Tooth Fairy – came into existence, or at least how they joined together to protect the children of the world, we’re introduced to Jack Frost, voiced by Chris Pine, who can’t be seen by people because they don’t believe in him. Throughout the movie, Jack is searching for his past, which he can’t remember, and it’s his search for answers that becomes the focus of the film. The actual Guardians take a backseat to this quest, and it often seems forced, especially in the film’s relatively short run time of an hour and a half. Regrettably, even if you take Jack Frost out of the picture and focus solely on the Guardians and on the antagonist, Pitch (i.e. The Boogeyman), there are plenty of problems. The Guardians rely on children believing in them to fuel their powers, so when Pitch interferes with the Guardians’ duties and causes children to stop believing in them, they start to lose their power. This is all fine and dandy and makes sense, but the problem I have is that the film implies that disbelief in one Guardian results in disbelief in the others…which doesn’t even make sense. For example, Pitch prevents the Tooth Fairy from collecting teeth and leaving coins, so the children not only stop believing in the Tooth Fairy (as if every child in the world was waiting for their teeth to be taken anyway), but also in the other Guardians. Personally, I don’t think that disbelief in the Tooth Fairy or in the Sandman would affect my belief in a being like Santa, who plays such a huge part in our popular culture. Aside from that problem, which particularly bothered me, Santa’s helpers, which comprise of elves and yetis, seem to be just cheap imitations of the Minions from Universal’s Despicable Me. I had high hopes for this film, perhaps too high, which made my disappointment all the more upsetting. The film boasts an all-star cast, wonderful animation, and a beautiful score by composer Alexandre Desplat, but none of that is enough to save itself from a plot that is far less inspired than what was promised by both the trailers and the title. I wish that things had turned out differently, but, as much as it pains me to say it, Rise of the Guardians failed to captivate me like I had hoped, but, to a less critical person, it may be decent enough to entertain. P.S. – Read my review of this film’s score, composed by Alexandre Desplat, here! I would love to sit here and tell you all that The Bourne Legacy was just as good as any film in the original Damon trilogy, but, unfortunately, I can’t. While I did enjoy it, this is one of those films in which the bad or not-so-great outweighs the good. The plot was weak and confusing; the entire first half of the film had me wondering what was happening, who was who, and why certain decisions were being made. While this wouldn’t have been a problem if all of my questions had been answered later in the film, most of them weren’t. I think that the film suffered from being set within the timeline of the original trilogy; references would have been fine, but this film takes place during and immediately after the third film, making things feel forced and a bit rushed. It would have been better to see the main character as a member of a completely separate, unrelated-to-Bourne project so that the film could be viewed less as a sequel and more as a continuation with a new focus. I also wasn’t a huge fan of the whole “chemically-altered super-human” part of the story…it worked for Captain America because he is a superhero set in a different universe with different rules than ours. While this type of chemical altering may eventually become reality in our own universe, it just feels silly in the context of the film; a super-human doesn’t have the same appeal as a highly-gifted and intensely-trained person in a non-superhero world. I enjoyed Jeremy Renner as Aaron Cross, but I felt that the character’s “motivation” was not adequate enough to justify the full movie. It is not the attempt on his life that motivates him (at least, it doesn’t feel like it is), but, rather, his dependency on some pills distributed by the organization he works for that seems to push him into action; the entire middle portion of the film is watching Cross find a way to get his hands on some of these pills. I also had a problem with Rachel Weisz’s character, Dr. Marta Shearling, a woman who seems to take no issue with the fact that Cross is capable of fighting and killing with apparent ease…there’s not even a moment’s flicker of doubt as she continues on her journey with this violent man. In The Bourne Identity, Marie tried to run away from Jason Bourne when she found out who he was and what he was capable of, only staying because Bourne convinces her that she needs him to survive…for at least a little while. There’s a moment that is sort of like this in The Bourne Legacy, but it is subdued and less effective. She asks no questions and makes no attempts to flee. Though the character wasn’t as fleshed out as he could have been in the script, Renner as Aaron Cross worked wonderfully as the follow-up to Damon’s Bourne. Renner plays the character with a resolve that almost makes you forgive the rocky motivations that Cross acts on. Edward Norton was excellent in this film. His character, Eric Byer, is in charge of cleaning up after the CIA’s “Treadstone” and “Blackbriar” programs (the programs that created/tried to kill Bourne, respectfully). He’s got a sharp tongue, a firm authority, and a sense of urgency that you can’t help but admire. Another bright part of the movie was the action; Jeremy Renner did a great job with the physical aspect of the character as well, giving us fight scenes that, while not as inspired as the first fights in The Bourne Identity, entertain without becoming too much of a good thing…with one exception. The last twenty minutes or so of the film consists of one overly gratuitous chase sequence…it just takes way too long. Let’s face it: The Bourne Legacy had quite a – well – legacy to live up to. The original trilogy starring Matt Damon in the title role was excellent in terms of plot, character development, emotion, and action. Unfortunately, Legacy fell short in just about every regard, but just because it isn’t as good as the original trilogy doesn’t mean that it isn’t enjoyable – because it is. The Bourne Legacy delivers plenty in the way of action and humor, and, after his brief screen time in The Avengers earlier this year and his supporting role in Mission Impossible: Ghost Protocol, it was nice to see Jeremy Renner as the main protagonist. Boosted along by a fantastic score by James Newton Howard, The Bourne Legacy may disappoint die-hard fans of the original trilogy, but it is still a fairly entertaining summer action film that will please the average moviegoer. P.S. – Read my review of this film’s score, composed by James Newton Howard, here!